← She Says… Baby’s First Halloween! Remember this post and this post from a few weeks ago about how my little Houdini could get out of every swaddle, including the Miracle Blanket (which I love the MOST and have continued to used, even though it gets a little loose by the end of the night sometimes)? Well, the tables have turned. After Tweeting that picture of Owen busting out of the Miracle Blanket (which still makes me laugh every time I look at it), Tamara from PeaWee Baby contacted me to say that she had created a swaddle that he couldn’t get out of. The challenge had been set. You know what? She really did. There’s no way he could get out of the SwaddleBuddy Sack. Generally I tend to steer away from swaddles with velcro since my little incredible hulk seems to be able to bust right out of them (and the sound of the velcro always startles Owen awake), but the SwaddleBuddy’s velcro is quiet and strong. And although it seems a little confusing at first (the shape is nothing like other swaddles I’ve tried), it really is quite easy to put on, even on a squirmy little guy like Owen. I highly recommend the SwaddleBuddy Sack for any other little Houdinis out there! In the last few days Owen has preferred to be rocked to sleep on his tummy rather than his side, and he has been waking up and crying when I turn him to his back to sleep (for daytime naps only… nighttime he doesn’t mind his back… strange). I wonder if this is the beginning of moving towards sleeping on his tummy, unswaddled? Anyone else gone through this transition? Is it just something the baby chooses for himself? I know I’m not supposed to let him sleep on his tummy before he can roll over purposefully, but he’s rolled over a lot of times and has really strong neck and chest control. When did you stop swaddling? Why? How did the transition go? This entry was posted in She says... and tagged 3-6 months, baby, development, sleep. Bookmark the permalink. Super cute sack! I love it! When my kids were slipping out of the swaddle, a friend taught me this crazy-double-straightjacket swaddle. It was awesome, and we used it for a few more months (http://www.goddessinprogressblog.com/2007/11/uber-swaddle/). My gradual attempts at ditching the swaddle were not successful, so I ended up lumping it together with general sleep training at 6.5 months and we were done. And yes, my son immediately became a tummy-sleeper, though not really my daughter. I stopped swaddling my son when he was a couple of months old. He loved to have his arms out, so the swaddle seemed kind of pointless. He now sleeps in a sleep sack and loves it. I needed to transition him anyway as its coming into summer here and gets very very hot. Hunter still can’t sleep on his tummy at 5mo. Every time he rolls over onto it (either at night or during a nap) he automatically thinks its tummy time and lifts his head up. That wakes him up and he starts screaming. Fun. 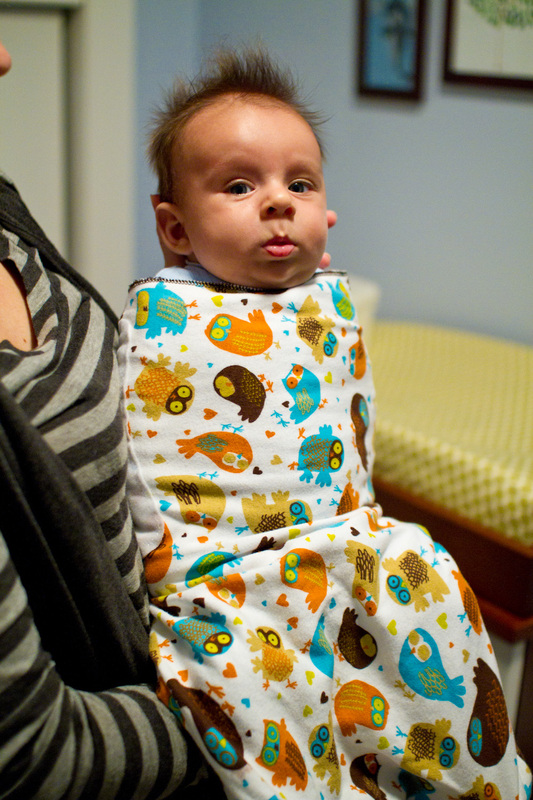 That swaddle is super cute too! I stopped swaddling my daughter at 4 months. She had been getting out of them but every time I tried to have her sleep without it she couldn’t fall asleep so we kept using one. But at 4 months she started rolling from her back to belly and wouldn’t stay on her back to sleep so I didn’t want her in the swaddle on her belly. So we went cold turkey, the 1st 2 nights were hard but after that she was great! I love that swaddle! So glad you posted this and can’t wait to read the follow-up comments, my little guy (a week older than Owen) loves to be swaddled and I’m wondering when I should break the habit. The past few nights he’s cried a little after he’s been down to sleep for an hour and part of me wonders if he’s ready to be unswaddled. I also second the sleep sacks as the next step, my older son wore sleep sacks and they were great. We transitioned my daughter from swaddling to a sleep bag around 9 or 10 months. At that point we were having to use two swaddling blankets to keep her in, using two different kinds of swaddle wraps. Fortunately it was winter and the extra layers weren’t a problem. When she still wasn’t sleeping through the night at 10 months we decided to combine the switch with sleeping training. When she still wouldn’t sleep I began putting her down on her tummy and finally she slept, for about 6 weeks and then we had to start the process all over again. It’s great that you found a swaddler with velcro that worked for you. The velcro ones wouldn’t wrap snuggly enough for my daughter and she would always wiggle her way out. We ended up buying large flannel swaddling blankets from Target and learning various manual wrapping methods. I stopped swaddling at 4 months. I wanted baby to get used to having her arms out since I was not going to be swaddling her forever. At first she kept waking her self up but like any transition after about a week everything was all good. A side note–as soon as we stopped swaddling she would sleep on her tummy. I never rolled her back, I just let her sleep. We stopped swaddling at 3 months. The ped said we should stop because her startle reflex was less and she should be able to move around. We just stopped cold turkey and she was fine with it. We use the halo sleep sack for bedtime as I’m still not big on the blanket in the crib. That swaddlers looks adorable, though, and Owen too, as always! I had to stop swaddling 3 weeks ago, just before my daughter turned 5 months old, because she was starting to roll over in the swaddle and once that happens, it becomes dangerous for her to be swaddled. Boy, do I miss it though! She started sleeping through the night at 6 weeks but ever since we had to put her to sleep without the swaddle, she wakes up at least 2 or 3 times a night now. When she was swaddled, she didn’t mind sleeping on her back but now she immediately rolls over onto her stomach the second she’s put down on her back. I’m not sure why she’s waking up so often during the night but I sure am feeling nostalgic for the swaddle. My baby is just 10 days younger than Owen and he is trying to roll over but hasn’t done it yet, so I have the same dilemma – I don’t want him to roll over while he’s swaddled because babies need their arms free to safely maneuver on their tummies. He is also enjoying sucking on his hands/fingers and I certainly don’t want to discourage that. So, maybe I’ll try a sleep sack? I never liked them w/my other son but maybe we’re ready. One word: reflux. My LO will not be swaddled and cannot sleep on her back without an angled surface. That may be why Owen struggles so hard to break free of the confines of his swaddle–back sleeping hurts for our unlucky little babies with GERD! My daughter prefers sleeping on her stomach. Because I am incredibly paranoid about SIDS, she sleeps on me so that I can monitor her breathing [my brain is so mommy-wired I stir if she so much as pauses]. Do what’s best for you and your child! Sometimes the recommended sleeping position isn’t right for everyone!